Rayyan was a "star" in my eyes when I first saw him in a litter of seven at the Shamalis. I had taken the job over the weekend to take care of Inger and Christer Salukis when they travelled to Skokloster. I didn´t no then if Rayyan was booked of someone else but I felt that if I couldn´t get this beautiful puppy I shouldn´t have anyone else either. I loved his beautiful refined head, the expression, the overall balance and the colour; a black and white grizzle whith long silver hair shimmring in the sun. He captured my heart. He wasn´t booked when I have decided to call them and ask if I could buy him! Looking back he filled all my expectations of what you could ever wish. Rayyan was my first own Saluki and maybe I never could experience so many different parts of the dog world through a dog again. 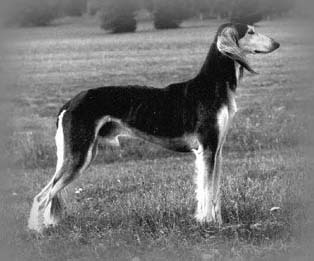 He was a special kind of Saluki in a lot of ways for me! And it really shows out to be that way because he also is the reason for this salukisite. I felt that when there is frozen sperm out of him to four litters I maybe through this site could show the future puppy owners how he look liked. It was by the intiative from Elizabette and Bo Kallin-Forssberg, Khalils salukis, the whole came true; that some day in the future Rayyan could make a contribution as a stud again long time after his was gone. When it all started there was two more breeders interested; Christer Edling at Shamalis and Marie Borslöv at Rahimas kennel, except for myself. At the age of ten we took Rayyan and travelled to The Swedish Agriculture University in Uppsala to keep his genes for the future. Rayyan has four litters; two at Shamalis 1990 the "A" litter (3+1) out of Ch Shamali Walda-al-Alaq and 1991 the "B" litter (2+3) out of Ch Shamali Yamina-a-Mahir. The other are Red Hawks "W" litter (0+ 4) out of Ibinores Evi and Ritzas "J" litter (2+3) out of Ch Ritzas Hamingja which both are born 1991. This year Rayyan easily gained his championtitel and also 3 CACIB, 2 Best of breed, BIG2 and 3 BOS. I went with Rayyan to a show in Finland for Kari Nylén and gained the finnish titel with CC and Reserv CACIB. At a show in Trondheim, Norway, for Knut Blutecher, Rayyan won his nordic championtitel and CACIB for his international championtitel. Rayyan has also approved mental test.